Microsoft has introduced a new version of SQL Server Management Studio in the first CTP1 preview of the next SQL Server version code name Denali. The new SSMS is based on new VS 2010 shell and brings some new features. One of the new features introduced in the CTP1 are new code snippets. Who was working with third party tools or was developing applications in Visual Studio, for sure knows this feature well. You can manage the snippets using the Code Snippets Manager available from Tools menu. The code snippets are using the standard VS2005 snippet XML format, so you can use current available tools for creating and modifying the SQL Server snippets. The expansion snippets are similar to the Templates known from previous versions of SSMS and which are also available in new version of SSMS. You can insert the snippet using the menu Edit/ItelliSense/Insert Snippet…, using a default keyboard shortcut Ctrl+K, Ctrl+X, or using the context menu after mouse right click. Once you invoke the command you can choose from the available snippets. The snippet behave differently from the Templates. After the snippet is inserted several replacement parts are highlighted and you can substitute the default values by your own. Then all all occurrences are automatically substituted in the snippet. You can switch among the replacements using the Tab key. Once you are ready with modifications you simply hit the Enter Key. In contrast to Insert (Expansion) snippets the Surround with snippets take all the selected text and surround it by the code contained in the snippet. Surround with snippets are again accessible using the menu or Ctrl+K, Ctrl+S default shortcut. The current snippet implementation in SSMS has only a few possibilities and small power comparing the to snippets in Visual Studio. Hope that it is only by the current CTP status and Microsoft will implement following before the final release of the product. 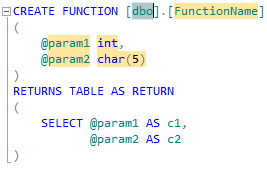 I would welcome a functions element functionality in the SQL snippets. E.g.. Function for expanding table fields from a table name etc. Something like GenerateSwitchCases function for expanding enum members in C#. By adding such functionality it would be very easy to write a easy to use complex snippets e.g.. for CRUD procedures generation etc.. SSMS Denali is Based on VS 2010 and visual studio doesn’t allow writing custom functions for use inside of snippets, at least Microsoft could introduce at least the function for table expansions I mentioned here.